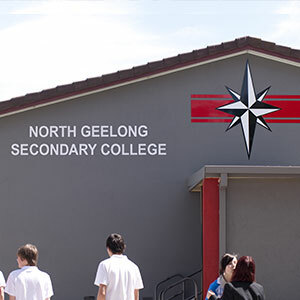 North Geelong Secondary College is a single campus school that has a traditional classroom structure supported by an innovative curriculum. 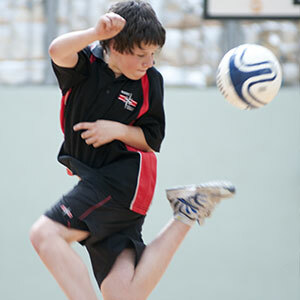 The school places high expectations on academic endeavour and student behaviour. The College has committed and highly skilled teachers who encourage students to build positive and individual identities, helping them to develop the confidence and self-esteem that leads to individual learning success. Our staff supports students to become self-assured young adults ready to pursue their interests, hopes and dreams. Our students are supported in their learning by well-maintained, refurbished and new facilities. The school’s manicured gardens and quiet eating places are complemented by a canteen, outdoor covered area and outdoor furniture. We also have a number of state-of-the-art synthetic turf surfaces for students to play a range of sports including soccer, volleyball, tennis and netball. Gym and outstanding sporting facilities. We show leadership by taking responsibility and being committed to our vision and to each other. 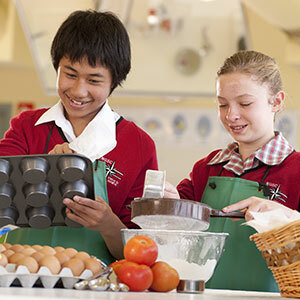 The year 7 – 10 curriculum is based on the new Victorian Essential Learning Standards. There is a core program in years 7 and 8 and an elective program in years 9 and 10. The years 7 and 8 curriculum provides student with a solid foundation for future learning by building sequential knowledge and skill development in English, Mathematics, Science, Social Education and Languages Other than English (German and Japanese). The school has a vibrant arts, technology and design program where students enjoy a range of creative learning experiences. The Health and Physical Education program places a strong emphasis on active participation and promotes lifelong healthy life styles. Year 9 students are required to undertake core studies in subject disciplines. They also have opportunities to select from a broad range of arts, technology and language subjects. Students are encouraged to progressively take more responsibility for their own learning. There is a strong emphasis on building interdisciplinary skills in communication, inquiry based learning, problem solving and using Information and Communication Technology. This curriculum effectively assists students in the development of a global perspective and active citizenship. In Year 10 students have the opportunity to select subjects which are future focused reflecting their further study options. Year 10 students also have the opportunity to choose a VCE or VET subject to enhance their experience with future University, TAFE or Apprenticeship pathways. In year 11 and 12 students have access to a broad range of VCE and Vocational Education and Training (VET) subjects and may choose pathways from the VCE and VCAL programs. The Department of Education & Early Childhood Development provided the college with a grant to install 3 wheelchair access ramps to allow wheelchair access to all classrooms. Ramps were constructed to provide access to the main Classroom wing (C), in the Arts wing (B) and in the Technology building (E). These ramps have been installed and accessibility to all buildings have improved.